This was taken a couple of years ago. I'm doing a fair bit of work at the moment, but hope to be back on the road in a few months. do you still have the fasty? im in paisley and have a texas yellow square!!!! Yup. It's in my garage up on axle stands having all the suspension gubbins replaced, cleaned, painted etc. Target is to be back on the road by July or August. Some of it looks like it's never been apart and every nut is a battle at the moment. You on the West of Scotland site,too? Coolio! Need to get a wee look at it! Looks superb in the old picture! Mines the same, bolts look awkward to remove and panels look as if they have been on forever! I have a few cosmetics to deal with, bubbles in the paintwork etc! !but will attack all of that in the better weather if it ever comes! Still, its my daily so all good!! Yip, in the club, if you get a copy of the club magazine you will see my square as the page 3 stunner ha!nice wee spread about it! Great to find out that another type 3 lives and breathes locally,especially a texas yellow one!!! Yellow is where it's at. There's barley a seventies car that doesn't look the dog's in yellow! As soon as I'm back on the road we'll meet up for some photies. Haven't been to a club night for about two years. It was a rusty heap whan I got it. A certain VW engineer then filled it with filler and I did a spraycan partial respray, and it looked great (from 10 feet) for about two years. Then the bodges started to make themselves known. I took it off the road, saved up and put it into Dave Mylett in Thornliebank who did a great job reintroducing something known as "metal" to the front end. You know of him? He gets my vote. After a brake and suspension rebuild, I'll get it MOTd and on the road, and deal with the rear end panels next year.That's the plan, anyway. Spot on dude!so many cool 70's cars I'm paisley/glasgow area that look the dogs (mine haha, triumph dolomite, austin, etc etc) nothing as cool as texas yellow though!!!! Yeah its funny how most of our cars look amazing from 10 feet plus!!!!!! I have a few bubbles and areas currently with filler until mr bank man allows me a visit to a body shop! Still enjoying it though! Thinking of changing my 2 litre replicas back to steelies with hubs, think they would suit the low and narrowed front end! Could do with new door cards to!! Yeah I haven't been to club night for almost a year now due to work commitments, one of those things!! Another Fasty in Glasgow.......no......frickin way! Thats sweet! Need to hook up and have a wee look at yer baby! I was doing a google of this reg number just for fun and found the car my Dad bought new and owned until the 1980s and 100k plus miles. Unbelievable. RJT is still looking good for the age, I can recall doing an engine rebuild and learning to drive in this car. It was bought from Loders Garage Dorchester Dorset and was the reliable family car for about 15 years. It sounds as if she needs some work. 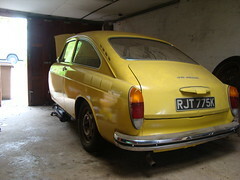 I'd be very interested in knowing more about this Texas Yellow T3 as it is today, I'd be glad if you can get in touch. I may have seen this car at Shillingstone, Dorset on a few occasions in the 80s. 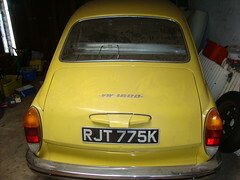 There was a very smart Texas yellow Variant owned by a guy who worked at the garage in Shillingstone, and we saw it there a few times as we went from Bristol to my parents' home at Wimborne. I did speak to the owner on one occasion when we stopped for fuel. I think he lived at Child Okeford or Okeford Fitzpaine. It was certainly in lovely condition then. I don't remember seeing many Texas yellow Type 3 Variants; many more Marina blue, as ours was back then. This T3 is a fastback, we lived in Dorchester at the time until 1980. I recall it was sold to someone in Buckinghamshire I think circa 1985ish. It always drove well and performed for over 100,000k before we rebuilt to heads. Never used much oil, just did what VWs do. my own first car was a t3 GRO 56G, I'm sure it's gone now, but a sixties model with old style front end. Oh yes, so it is! I was just putting 2 and 2 together and then forgot what I was trying to do! Brilliant to hear from you about your old family car. 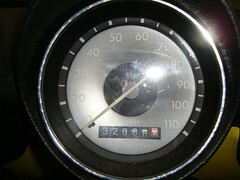 I bought the car for £800 in September 2004 when the mileage was 128,000, and since then I've done around 4,500 miles. I used it as my daily driver for a couple of years and it never missed a beat, in some pretty extreme weather, too. During that time I did home resprays of roof, bonnet, wings and boot. The bodywork was starting to look pretty tired, though, so I took her off the road two years ago. Only in the last nine months have I really got going on a restoration, and I've had loads of new metal let into the inner wings which were a mass of filler. They're totally solid now, and as the photos show, I've stripped, cleaned and painted all the front suspension components, and have two good new wings to go on (against the wall in the photos). The brakes calipers are going away for a complete rebuild and renovation, and I'll replace the master cylinder, and mybe the steering box too - there are only so many times you can adjust play out of the steering! Then it's an MoT and I can turn my attention to the rear end. I bought the car from a friend of my brother outside Hereford, and it had been in his barn for at least five of the ten years he'd owned it. He'd paid £1,100 in 1994 from a Mr. Forrest in Ross-on-Wye. I'm not sure if any details are missing between 1987 and 1994, but he appears to have bought the car at some point from a Mr and Mrs Gill somewhere near Cirencester (judging by the garage receipts), and it was Mrs Gill who bought it from your dad on 15th august 1987 (for £877). I know all this because the car came with masses of history, including the original bill of sale (for £848 - this car has not depreciated in 40 years!) Your family kept every little detail, which is hugely appreciated now. My grandad had a green fastback right through my early childhood - a fasty was the first car I remember being in - and I've always loved the look of them, particularly in Texas yellow. The future for RJT 775K looks bright as I have no intention of selling, and every intention of restoring her as fully as possible. Would be delighted to hear back from you with any other info or stories about the car, or scanned photos of from your time of ownership. Simon, Thanks for taking the trouble to post the photos, i'm so pleased this car is being looked after, as it was in it's first years with us. The doors and rear end look pretty straight, hope there's not too many surprises there. The car was never in an accident to my knowledge, and I remember my Dad being fastidious with keeping the underside well protected. I think underseal may have been an extra when new, anyway it was looked at after every winter. What do you think the mileage is now? It certainly had just over 100k when sold in '87, so 132k could be right. I can recall the usual task of checking the balance of the carbs, in the end Dad would resort to just balancing the sound each side. I'll try to find some photos of RJT in the early days and scan them. Probably holiday trips when the luggage spaces at each end came in very useful. It's been quite a while, just wondered how the restoration is going. Tried to find some old pics but looks like they aren't around, though I do keep a look out when at the family house. Thanks for getting in touch again. Just spotted your post now. 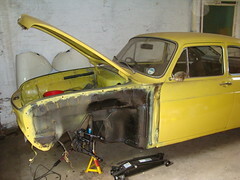 Have progressed with the resto by digging lots of rust and grot out of the rear end. Now needing quite a bit of tricky welding, which is beyond me. 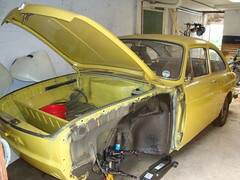 However, have the funds for the bodywork and, I hope, a respray - in Texas yellow, obviously! Hoping to be back on the road by late summer, and I'll post photos. So, getting there. Thanks for your continuing interest. If you were to find any old photos or details, I'd still be fascinated to see them.